Boil water in the saucepan. Using tongs, dip comfrey leaves into the boiling water. 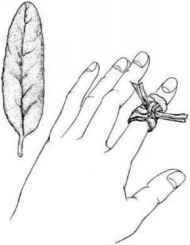 Wrap the leaves around the wound, holding them in place with a bandage, if necessary. Repeat with freshly heated leaves every 30 minutes. Note: This poultice is for external use on!y; do not apply to cuts or open wounds.